I don’t really listen to the radio anymore. I didn’t like that I wasn’t hearing a lot of new music, so I started digging around for music podcasts. Many of these are basically a shift on a college radio station in your genre of choice. (Later on, I’ll collect these into a single column.) One of these music shows stands out, We Have A Technical. If you have ever spent a night of drinking talking about who’s the better drummer, or whether digital remasters ruin old records (Spoiler Alert: they do), then you need to check out We Have A Technical. 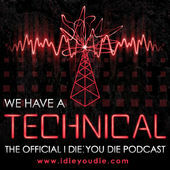 The name comes from a Gary Numan song, as does the name of the podcast’s parent blog: I Die You Die. The blog is a review and interview site for all things Industrial, though they do occasionally branch out into Goth rock and other spooky subgenres. I have always had a soft spot for the aggro keyboard rock, but the podcast has really helped me update my taste from the mid-nineties. (I have an embarrassing amount of KMFDM in my iTunes library.) The two hosts, Alex and Bruce are both club DJ’s with a huge breadth of genre knowledge to draw from. If you’ve ever spent an hour standing around talking at a record store, you’re going to love this show. The combination of reviews, discussions, and artist interviews keeps the show feeling fresh week to week. I’m particularly a fan of their record commentaries. As someone who has repeatedly annoyed people at the bar by forcing a two hour discussion about records that changed my life, I love this kind of breakdown of important records in the genre. If you aren’t into the spooky keyboard rock, I am not sure there will be much for you here. However if you have even a passing interest in the music, you’ll find We Have A Technical to be a good way to find new bands worth checking out. If you want some specific episodes to start with, I recommend their album commentary for The Crow Soundtrack. If you’re still on board with that I then recommend you go with something a bit more contemporary and check out their interview with Youth Code. Thanks for the shout out Michael! We really appreciate it!